Looking at the global order and the influence of the great powers on the same, we can conclude that in 2019 no longer should we speak about the unilateral division of power on a world level. The United States, their power and influence are not to be doubt, but China’s growth and development have brought this far-eastern state to a level that allows us to speak of it as a real competitor whose influence on the global order must be viewed with equal attention and significance. Traveling through the European countries of Chinese President Xi Jinping has shown that China has already become a significant partner not only to Eastern European countries, with which it links the legacies of communism, or socialism as a socio-economic order, but also close co-operation with China, of countries like Italy, Monaco and France, with whom she has signed numerous agreements, of which the most significant is the one with Italy. Italy became the first member state of the G7 group of the most economically developed countries, which officially supported China’s strategic initiative called “Belt and Road”. 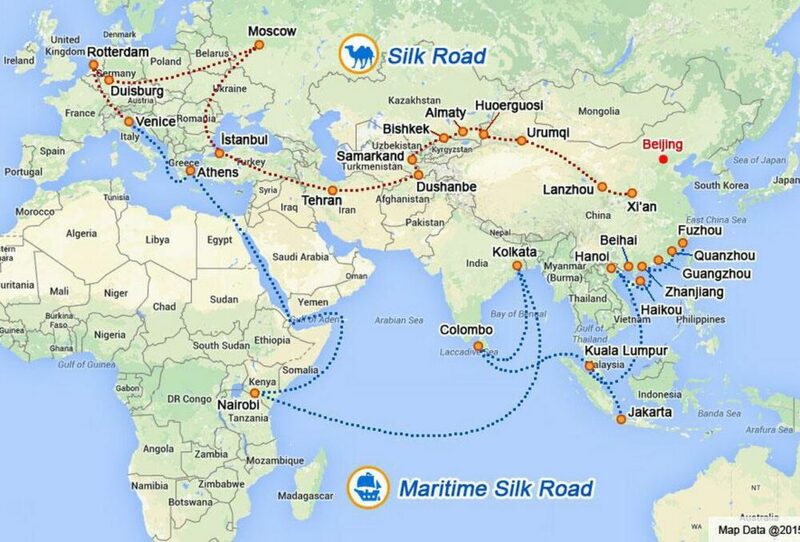 Since the launch of the initiative, originally called “One Belt – One Road”, and often seen as China’s desire to establish a new, economic “Silk Road”, China has become, through financial arrangements, if not the most significant, then one of the most important partner countries not only Asia and Africa, but also Europe and Latin America. This strategic initiative, the brain child of the current Chinese president, who has become the most powerful political figure in recent Chinese history, both with his strategic doing in the international sphere and in the way which he conducted the internal politics. Among other things, the Chinese Communist Party decided in 2018 to abolish the limit on the number of terms one president can perform. China imposed the limitation on two presidential terms in the 1990s, and Jinping will be the first president since then, who will be able to remain in power for the rest of his life. Initially, his second term was to end in 2023. China’s presence in international relations could often be identified through the implementation of projects under the “Belt and Road” initiative. Experts estimate that the total value of Chinese capital, which will be invested in infrastructure and other projects, ranges from one trillion of US dollars and up to 8 trillion in less conservative estimates. While the consequences of this initiative in the countries that are included in it and in countries that are China’s competitors in the global “Game of Thrones” are valued differently, the real results are indeed diverse. Through infrastructure projects, China truly contributes to the development of countries requiring financial injection, in particular, through loans that China provides. The loans coming from Chinese banks are seen as an alternative to the financial arrangements provided by international financial institutions. Chinese loans come under the conditions that are different than those prescribed by institutions such as the World Bank or the International Monetary Fund. When giving a loan, it does not care much about the state of internal order, the level of democracy, the level of national debt of a state. However, such a way of acting puts borrowers into a position in which they can fall into the debt trap: repayment methods vary from contract to contract, and there are already some examples of what happens if the state is not able to follow the terms of the contract. Thus, in 2019, China gained its first military base outside its territory. Djibouti, one of the countries that are part of the “Belt and Road” initiative, was unable to pay its debts to China, and China took over the military base in that country, making it its first overseas military station. In addition to Djibouti, Sri Lanka has also surrendered one of its ports to China due to its inability to pay its debts. The massiveness of this initiative has made China the largest lender to the underdeveloped countries of the world, but it is obvious that the benefit is not only for the credit of the borrowing countries, but also the positioning of China internationally, the spread of political influence, and some more concrete benefits such as reducing transportation costs products, providing essential strategic points such as ports and military bases. The spread of the Chinese influence did not take place without creating several enemies. The biggest opponent of Chinese expansion are the United States. The beginning of 2019 marked the culmination of the US-China trade war. Introduced fees for importing products from China were just the beginning. The continuation was followed during the US Secretary of State’s campaign, Mike Pompeo, in the countries of Central and Eastern Europe. The constant in his presentations was a warning on the potential harmful Russian, but also the growing Chinese influence. In 2012, China established a multilateral platform for cooperation with the countries of Central and Eastern Europe. The 16 + 1 summits have been held regularly, on an annual basis, and represent the central mechanism for the cooperation of China with 16 Central and Eastern European countries, an EU member states and countries that are striving to become it. Warnings about the danger of the spread of Chinese political power, through financial arrangements, loans and investments in these parts of Europe have resulted in countries like the Czech Republic, Poland and Hungary having to think about further relations with the country that has been so far source of important capital inflow. It seems that the European Union itself has become aware of the potential problematic influence of China. The Council of the European Union has adopted a screening mechanism by which member states will be obliged to review foreign direct investment, or their impact on the internal order and potential threats to the security of the member states. So far, only some member states have had this type of protection, while this act has announced that all others will have to go this way. It is believed that this mechanism was adopted primarily because of the dangers of new Chinese investments. The biggest threat to Europe from the spread of China’s influence is its (Chinese influence) penetration into Europe through the “small door” through the countries of Eastern Europe, as well as candidate countries, such as Serbia. Johannes Hahn spoke about the Balkan states as a potential “Trojan horse” of Chinese influence in Europe. The question is: Are such statements in place, especially considering the level of welcome that Western European countries provide to Chinese officials during the visits, the number of bilateral cooperation agreements, as well as the level of investment, where China stands out with nearly $ 50 billion FDI in UK, 22 billion in Germany, while, for example, Hungary is perceived as the best friend of China in the European Union, and data show that since 2010, inflow of Chinese capital through foreign direct investment to Hungary amounted to slightly over 2 billion. Not so coincidental, at the same time as Pompeo travels across Europe, there is a huge debate on the further development of infrastructure that will enable the launch of a new generation of telecommunications – the 5G network. Chinese company Huawei is the largest supplier of equipment used in the construction of 5G infrastructure. The Chinese company receives criticism for its closeness with the official Beijing and its pointed out that there is a reasonable doubt regarding the danger of data abuse, the submission of collected data to the Chinese government and the general threat to the privacy of citizens. The United States has banned Huawei’s participation in the construction of 5G infrastructure on its territory. As a member of the “Five Eyes” group, a group that looks at the development of telecommunications infrastructure globally and potential threats of abuse, the United States have put pressure on other member states of the “Five Eyes” group, Canada, Australia, New Zealand and Great Britain. Such a move led to the banning of Huawei’s participation in Australia and New Zealand, while the other two countries that are part of the group are currently in the process of considering the level of Huawei’s influence and assessing a potential ban on it. However, to date, no European country has banned Huawei from participating in the construction of the 5G network. Germany, also under the pressure of the United States, has rejected the possibility of banning the Chinese company from participating in this venture. Germany has argued its procedure exclusively for economic reasons: Huawei is already the bearer of much of the existing infrastructure in Germany, and the replacement of existing infrastructure, which would have to be done before the new one was set up, would be simply a big expense. What the Germans have announced are the guarantees that Huawei will have to give: the guarantees that the data collected will not be misused, will not be delivered to the Chinese state, and have announced the adoption of a new set of laws to be provided, popularly called, “Lex Huawei’’. That there are animosities on the global level regarding Chinese investments, also shows the arrest of Huawei’s representatives in Canada and Poland. After the allegations for abuse of position, representatives of Huawei were arrested in these two countries. In addition, the Czech intelligence agency pointed to the dangers of existing contracts with the Chinese company. This action also triggered the Beijing’s official reaction. The indication that the moves were primarily political, not evidence-based, was the expected reaction; however, in the event of the arrest in Canada, diplomatic steps were initiated to release Huawei’s representative, but the representative in Poland was fired and the company denied any further connections with the representative. An additional threat arising from the use of Chinese telecommunications technologies is the danger to the privacy of citizens themselves. The technology that allows face recognition raises question regarding not only abuses that might occur, but also the manner in which the data collected will be used. In China, a beta version of the program is being tested at this time, allowing the so-called ‘’Social Credit’’ system to be tested. ‘’Social credit’’ represent a system of assessment and scoring of the behavior and lifestyle of citizens of the People’s Republic of China. Through the data collected by video surveillance, citizens are awarded a certain score on the basis of which citizens are provided or denied access to certain services, such as: high-speed internet, possibility to travel abroad, and good employment or bank loans. As much as this sounds scientifically fantastic, it has already been applied in the test version in China and the very idea that a similarly similar technological infrastructure would be present in Europe (or other parts of the Western world) is scary. While Huawei is under the scrutiny of the international community that is pointing out the danger of abuse of technology and social credit system is implemented at the moment, Serbia’s cooperation with the Chinese company has been increasingly deeped and strengthened. Huawei signed several agreements on strategic cooperation with the Government of the Republic of Serbia in 2917, but also with Telekom Serbia on economic and technical cooperation, including the construction of 5G infrastructure 5G. At the beginning of 2019, Interior Minister Nebojsa Stefanovic announced the installation of 1,000 surveillance cameras, at 800 locations in Belgrade. And while the announcement did not indicate that the supplier of the hardware was Huawei, the company itself confirmed on its web that it was part of a “Safe City” project. During the first phase of the project, 35 cameras have already been set up, and it has been announced that they were used to collect data that enabled the handling of criminal and misdemeanor acts. Apart from the benefits that the cameras will bring in increasing the safety of citizens and the increased percentage of solving criminal cases, experts have already stated the possibility of abuse and threats to the privacy of citizens. How this type of technology will be used remains to be seen. Of course, this does not only depend on the will of Huawei, but also on the ultimate beneficiary of technology: police, judiciary, intelligence agencies and relevant ministries. In order to understand how the “Belt and Road” initiative functions, we do not have to go far: Serbia is a representative example. Since 2009, when an Agreement on Economic and Technical Cooperation in the field of infrastructure between the Government of the Republic of Serbia and the Government of the People’s Republic of China has been signed, there is an improvement in economic relations and that year can be taken as the first year of intense Chinese-Serbian cooperation. Since then, the relationship between Serbia and China also got the symbolic name “Steel Friendship”. If China has become a significant partner of Serbia, numerous projects have been or are being implemented in Serbia. The bridge of the Chinese-Serbian friendship, paradoxically called “Most Mihailo Pupin Bridge”, is the first significant project that has been implemented in the framework of joint cooperation. This project was funded from Chinese loans, while a Chinese construction company carried out the works. Since then, Chinese loans have been used to implement infrastructure projects such as the construction of the Corridor 11 highway, then the Belgrade-Budapest highway. The aforementioned railroad is the most controversial project so far: construction of the Hungarian section of the railway has not yet started because the Hungarian government has been criticized for not conducting tender and not carried out the process of deciding who the contractor will be transparently and in accordance with the rules of competition. Due to delays, during the 16 + 1 summit in Sofia in 2018, a new agreement was signed between Hungary, China and Serbia, which obliges Hungary to conduct a new tender. Continuation of construction in Hungary is scheduled for spring 2019, while in Serbia it is already in progress. China is extremely important from the point of view of infrastructure investments, among other things, because China controls the Greek port of Piraeus, and Serbia is the shortest route to the EU market. In addition to financial agreements in the form of loans taken by Serbia from China, foreign direct investments are on the rise. Until recently, the largest was the takeover of the Smederevo steel plant, while the year of 2018 led to the largest number of signed investment agreements so far, which included the purchase of RTB Bor by Chinese Zijin Mining, in the competition of Canadian and Russian companies, which represents a unique precedent. The announcement of the construction of a factory for the production of tires in Zrenjanin, as well as the industrial park in Borca, raises the level of Chinese investments of nearly 3 billion dollars, making it one of the largest investors in the period from 2010 to the present. The Chinese presence in the strategically important segments of the Serbian economy is so far interpreted as extremely positive. The political points that led to the maintenance of local giants, such as Železara Smederevo or RTB Bor, have secured the position of Chinese companies not only among the bearers of government, but also the general public, and is regarded as a friend of Serbia outside of international relations. The danger of a potential political impact is still not obvious, however, China’s good relationship with the ruling party is unquestionable. In October 2018, during the celebration of the 10th anniversary of the Serbian Progressive Party in Kraljevo, the only ambassador to adress the audience was the Chinese ambassador, while in December of the same year, Serbia addressed China for help in announcement, and then implementation of the formation of the Kosovo army. As a reason for the increased presence of Chinese companies, in addition to the proximity of the European market, there are also low-cost labor and low energy costs, so that it can be concluded that behind the “steel friendship” are well-calculated economic interests. Whether we are talking about Serbia, or about the global order, the influence and presence of China is interpreted in two ways. At first, it is positive, since it enables the inflow of capital, the development of infrastructure and other segments of society. Questions arise as to the long-term consequences: whether it is about creating a Chinese political influence, or a likely fall into the debt trap, if one country does not protect itself, it can also feel the negative side of China’s friendship. China has become a major global player and seems to have the strength to survive in that struggle, and it is understandable that countries that need a “big brother” in the field of international relations accept all the conditions of Chinese friendship, even if they were in a certain custom – harmful. Undoubtedly, the friendly approach and economic investment made it possible to spread the Chinese influence and secured the Chinese position of the real competitor in the field of international relations. What are the consequences of Cino-Serbian "steel friendship"?